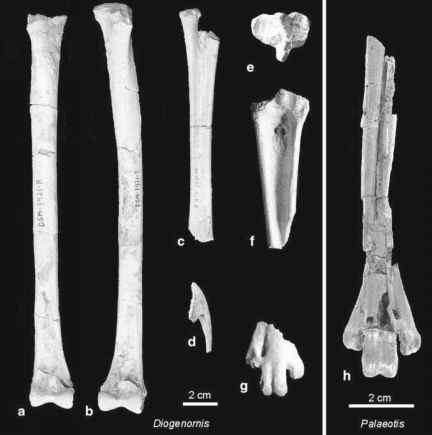 Paleogene fossils of this group, which is today confined to Australasia, were reported from the late Eocene (MP 16) of the Quercy fissure fillings and from Messel (Mourer-Chauvire 1989; Mayr 1999b, 2001b). The French species, Quercypodargus olsoni Mourer-Chauvire, 1989, is known from tarsometatarsi and distal tibiotarsi. 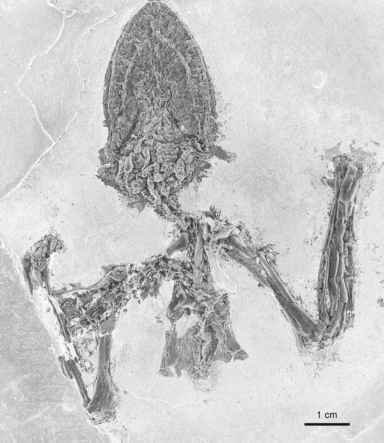 The species from Messel, Masillapodargus longipes Mayr, 1999, is based on articulated skeletons (Fig. 12.5), which show the characteristic wide, dorsoventrally flattened and broadly rounded bill of extant Podargidae. As in extant frogmouths, the ventral side of the upper beak seems to have been completely ossified. M. longipes has a somewhat narrower beak than crown group Podargidae and, among others (Mayr 1999b, 2001b), differs in the morphology of the coracoid and sternum. The legs are proportionally longer than in extant Podargidae, and the tarsometatarsus is also more slender than that of Quercypodargus.